When I was a kid, I lived down the street from a gas station. It’s a 5 Star Gateway, but before that, it was a Valero, but before that, it was about eight other things, and before all those, it was a Texaco. My dad stopped by there to get gas and brought me home a souvenir that caught his eye. Nothing says style like gradients! See, the gas station was selling a package deal of video game demo discs with toy cars. Now, I loved both of those things, and for them to have a Ricky Rudd stock car? When I already had a ton of the #10 Tide Ride of his from before? That was striking gold. That was excellent. I enjoyed the Need for Speed series at the time, and definitely enjoyed tinkering with the included demo. The 2001 Bud Shootout car at SEMA. Years later, I learned that what I had gotten was one of a set! So, I set about hunting down the rest... by which I mean I mentioned I was looking into the rest, so my mother pre-empted me and got them as a Christmas present. And looking over all of them, it does strike me as a bit curious, a little oddity with all these. I’m sure you’ll notice it. Anything just the slightest bit off, here? No? A slight incongruousness with what’s advertised on the package? Yes, in a strange twist of fate, this tie-in, which appears to primarily be between NASCAR and IndyCar collectible-diecast maker Action Racing, gas station Texaco, and video game series Need for Speed, where it just so happened the latest Need for Speed title was named Porsche Unleashed and featured nothing but Porsches, not one of these cars is a Porsche. Equity Marketing apparently masterminded this one. Jokes aside, I’m glad they did. Of course, kid me couldn’t care less. This was probably a smart move for American branding; a one-make series is a tough sell, let alone with a European sportscar. But try to sell an American kid in the earliest of the early 2000's on a NASCAR toy and that’s... I’m missing a metaphor, but it’s an easy sell, you know? A bit sparse on the sponsors. Those Firestone Firehawks are legit, though. And yes, they’re rubber. So, Action Racing was already making collectibles for IndyCar and NASCAR alike; it wasn’t too hard to slap on some branding for the molds they already had going. Having Mario Andretti’s 1994 Laguna Seca ride added a nice little perk for collectors. To my surprise, looking into them today, all of the Ricky Rudd paint schemes here were actually run at some point in 2001! So, basically, this was just business as usual for them, but paired up with a game demo as a pack-in bonus. I did find out recently when a friend came over and noticed the set that the software side of things and speculation as to how it all came together was covered well on Lazy Game Reviews, so I’ll focus more on the diecast side of things. It is actually kind of a shame this didn’t show up in the games or on track. This looks awesome. It definitely wasn’t uncommon then for toy cars to be packed with their video game counterparts; Hot Wheels did this a ton with sampler disks that included the car they were packed with, and even just having their main video games come with bonus Hot Wheels Interactive liveried versions of their main cars. Still got my Tow Jam proudly on display from then. Heck, the whole toys-to-life trend basically is this, resurrected. 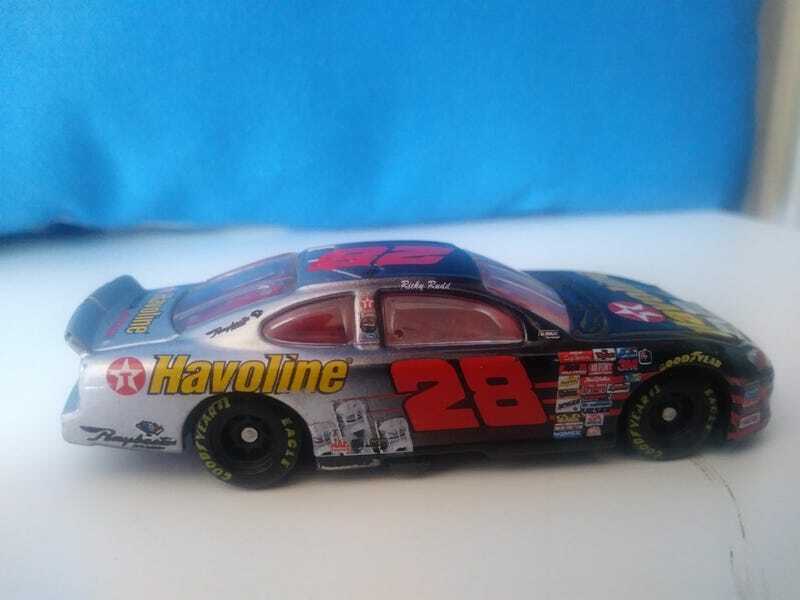 The more classic #28 used for most events in the 2000 and 2001 Winston Cup. Note the all-ages NASCAR Cup Series decal. These boxes are really hard to re-close. Anyways, I haven’t much else to say on these, so I’ll stop clogging the rest with text and let you enjoy the rest of the pictures unimpeded. This has been a pretty excellent Porsche event, and I couldn’t think of a better way to wrap it all up than with my introduction to the marque; a Porsche gathering including absolutely none of them at all. A smooth, clean paint scheme. 1994 was Mario Andretti’s last CART season, so this is a replica of that despite the 2000/2001 release. The sponsor logos aren’t blurry on the actual car. That’s my bad. The decals look a bit oddly small, but I imagine they’d warp if placed further back. This Need for Speed logo was used for... I think two games. They redesigned again for Underground. This looks really dang cool from the side. Actually, from just about everywhere.